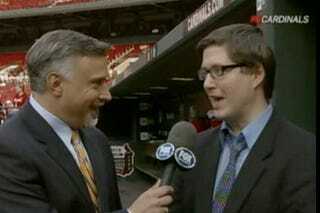 The floppy-haired hero from the hardscrabble streets of Mattoon, Ill. received a king's welcome at Busch Stadium and got the old pre-game treatment from the local Fox affiliate.For some reason he chose to wear Annie Leibovitz's eyeglasses. Yes, Will's chugging along through his book promotion tour quite nicely. If you haven't already, please purchase it for yourself or the paternal figure in your life who loves himself a roadie. Thanks for your continued support of Deadspin. Rubadub square is straight ahead.